What Are the Signs and Solutions For a Failing Dental Implant? Dental implants are one of the most life-changing dental procedures available today. They offer millions of Americans a way to replace their missing teeth with a restoration that looks and feels more natural than anything else. Another big reason that both patients and dentists love implants so much is their low failure rate of 2% (in non-smokers). However, although 2% is a small number, it still amounts to thousands of failures each year. So, how can you tell if you have a failing dental implant and what can be done about it? Keep reading to find out! What Are the Signs of a Failing Implant? Oftentimes, when failure does occur, it happens within 6 months to a year after an implant has been placed. This is the period of time when it must successfully fuse with the surrounding jawbone, which is a crucial phase because it provides the implant’s strength and stability for the duration of its life. With that said, there are rare cases when an implant fails many years after it’s been placed, possibly due to an accident, a serious illness, or poor oral hygiene. Thankfully, a single tooth implant in Memorial can often be saved if you seek out care early enough! Also, bear in mind that sometimes the implant itself is fine, but the restoration (dental crown, bridge or denture) needs to be replaced. How Can You Prevent and Treat Implant Failure? See a dentist for checkups every 6 months so the health of your implant can be closely monitored. Follow your dentist’s instructions as closely as possible at every stage of the implant process. If you’re a smoker, seek out one of the many smoking cessation tools for help with quitting. Maintain good oral hygiene habits, including flossing daily with the right technique (ask your dentist or hygienist for a demonstration if you aren’t familiar with it). If you need treatment at some point, a dentist might recommend an in-office surgical procedure to repair damage from trauma or an infection, or a bone graft to give your implant the extra support it needs. And remember: It’s crucial to contact a dentist as soon as you notice any issues with your implant. The earlier they can diagnose the problem and treat it, the better chance you’ll have of saving it! Dr. Mark Gray is a native of Memorial and a member of several professional dental associations, including the International Congress of Oral Implantologists. In addition to years of experience placing implants on countless patients, he’s also pursued advanced implant training so he can achieve a success rate as high as possible. 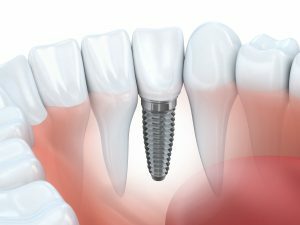 If you think you have a failing dental implant and have any other questions, he can be reached via his website or at (281) 493-9395. Comments Off on What Are the Signs and Solutions For a Failing Dental Implant?